Mazda has decided to use the hype caused by the development of electric cars in order to set the stage for its new, revolutionary gas engine. The newly developed Skyactiv-X engine is much more efficient than any of the motors currently in use. Mazda has designed the new motor to use compression in order to ignite the fuel-air mixture, rather than the traditional spark. The development of this gas engine is an odd choice for the company, considering the fact that most specialists assume that all-electric cars will replace gas-powered vehicles in the next 20 years. While one could argue that this is simply an assumption, it is impossible to ignore the fact that there are numerous carmakers that are currently releasing long-range electric vehicles. Also, the popularity of EVs must be taken into account in order to properly assess how realistic it would be to see only electric vehicles in the streets, in the next two decades. In this respect, vehicles such as Tesla’s Model 3 cannot be ignored, considering that it already has 500,000 pre-orders. The first one is the long charging times that most electric vehicles have, considering that, while the operating range of electric cars has increased in the last few years, it is still shorter than that of vehicles that are equipped with gas engines. In essence, charging an electric vehicle can take an hour or more, and the batteries will only last for up to a few hundred miles, while it takes only 5 minutes to fill up the tank with gas and drive for just as long. The second issue is that electric vehicles are insanely expensive when compared to regular gas-powered cars. This is largely due to the fact that lithium-ion batteries are expensive, regardless of how efficient they are. As a result, even budget electric vehicles are expensive, when compared to regular cars. Regardless of how promising electric vehicles may or may not look in the long term, traditional gas engines are still being developed, as we can see from Mazda’s initiative of releasing the Skyactiv-X engine. 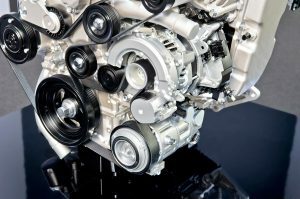 The carmaker has announced that the plan is to introduce the new motor by 2019, making it the “world’s first commercial gasoline engine to use compression ignition…” In layman’s terms, this means that the new engine will function the same as a diesel one, without a spark plug, except that both the torque, as well as the fuel-economy will be higher. The company needs technological advancements such as its Skyactiv-X engine, in order to keep up with the increasingly popular eco-friendly models of cars released by the competition. In terms of pricing, it is unlikely that cars equipped with the new motor will cost much more than the ones already produced. Also, the new engine can be introduced into current designs at no extra cost in terms of production. Mazda may have developed a gas engine in a time when other carmakers are showing off concept EVs, however, many of these vehicles may never make it to the production lines. The Skyactiv-X engine will go into production in a couple of years. they should combine it with hybrid technology to increase fuel efficiency and lower co2 emissions. That is part of their plan, but it’s not their first priority. Mazda stated they will optimize the engine first, because engine efficiency is still the controlling factor for the final efficiency of a hybrid. Once they have squeezed everything out of the engine, then they will tack on a hybrid drive. The advantage of their strategy is that they keep costs down for as long as possible. Simple hybrid systems may add ~$2k to a car’s cost, but a better engine may add less than $500 to get the same result.